Sergio Marchionne wasted no time on that one. Newly minted Ferrari CEO Sergio Marchionne (who also heads FCA) recently sat down for a wide-ranging interview with Automobile Magazine. The interview touched on many topics, including who will head FCA when Marchionne retires and the future of the automotive industry. But perhaps the most interesting part of the interview, at least to gearheads, was Marchionne casually confirming that the Ferrari LaFerrari Spider is set for production. This comes as no shock as a convertible LaFerrari has been talked about since 2014. 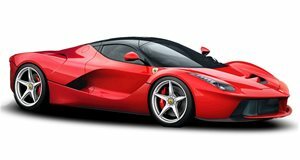 The topic of the LaFerrari Spider came up during a discussion about the possibility of a new V6 Ferrari, a revived Dino. Ferrari’s CEO was less forthcoming about the possibility of a V6 model, raising concerns of where to place it in the lineup along with concerns over cost and production numbers. But when it came to a LaFerrari Spider, well that’s a cut and dry subject. “And by the way, the only future product connected to LaFerrari is the Spider. Which is no secret since potential customers have already been approached," Marchionne said. Back in March we heard that potential customers had been approached by Ferrari about a convertible LaFerrari at a special event. Attendees got a nifty little gift box outlining the silhouette of the car. In addition to the leaked gift box information from "company insiders" also got out. Reportedly FXX K owners will get the first chance at the new LaFerrari and production could fall somewhere between 150 to 200 units. Right now the only thing that’s official is that the LaFerrari Spider is in the works. As for pricing and production numbers, well you’ll just have to wait until the next time Marchionne feels like spilling the beans during an interview. Or until the Paris Motor Show. Whichever comes first.